Following a successful trial in two stores, we are delighted to see Homebase rolling out the scheme to 20 stores in total throughout England. The idea is to offer customers free use of a Christiania cargo bike to help them with bringing home their bulky or heavy purchases in a quick and easy way. Those cargo bikes are real solid work horses with the capacity to carry up to 100 kgs plus the rider and a volume of 270 l. The bike comes with a rain tent, a helmet and a heavy duty lock. The hiring process is straightforward with no need to book in advance. You’ll be asked to fill a couple of forms, shown the basics on how to ride the cargo trike, and off you go. Most staff in the store were intrigued when the Christiania bike was first brought in as, for some, it was the first time they ever saw one. ‘Baffled’, ‘dubious’ was their first reaction but it wasn’t long before the cargo bike effect did its magic! And along with requests to hire it, they now have come round to the fact that this is actually a very good idea. Speaking from the Homebase store in Finchley road, Gita says: “interest is picking up again now that the weather is a bit better. There isn’t a typical customer really, she adds but she has seen people going for a purchase they may not have done had they have to carry their stuff home, walking. Plants and other garden items are the most popular articles people chose to ride home. Similar services are used elsewhere by companies such as Ikea and Silvan to name a few. Such offers make business sense as it allows customers to go ahead with an impulse buy they may not have considered. 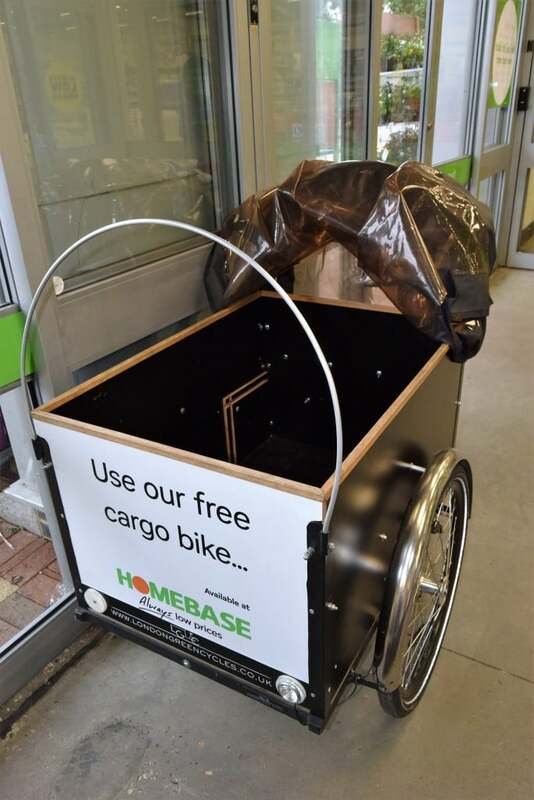 A cargo bike is a great addition to anyone’s life but sometimes its use is only occasional so having one available as when and if needed makes perfect sense for a retailer such as Homebase. It will get you home in no time and you have the added satisfaction to have done so without contributing to any more pollution or congestion in your local area. 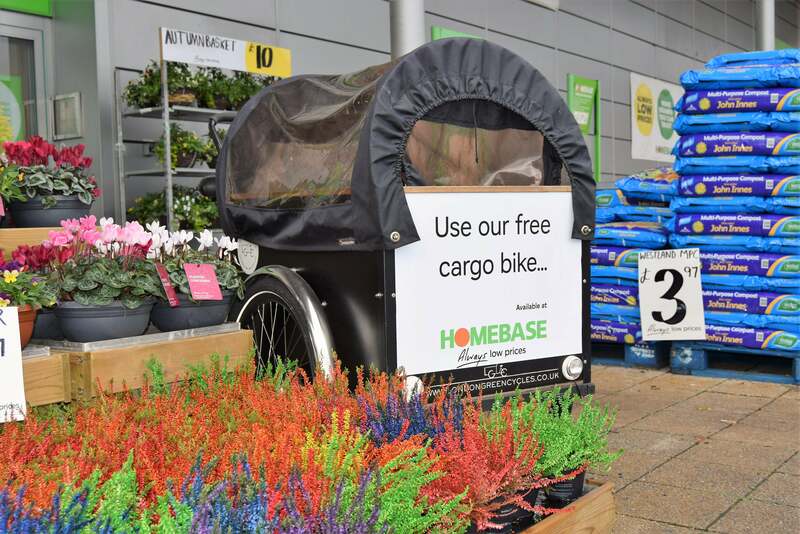 Homebase is the latest name to be added to a growing list of UK retailers who have shown forward thinking with the use of alternative ways for transporting goods. Let’s hope this is the start of a trend that will soon firmly established itself in the country. 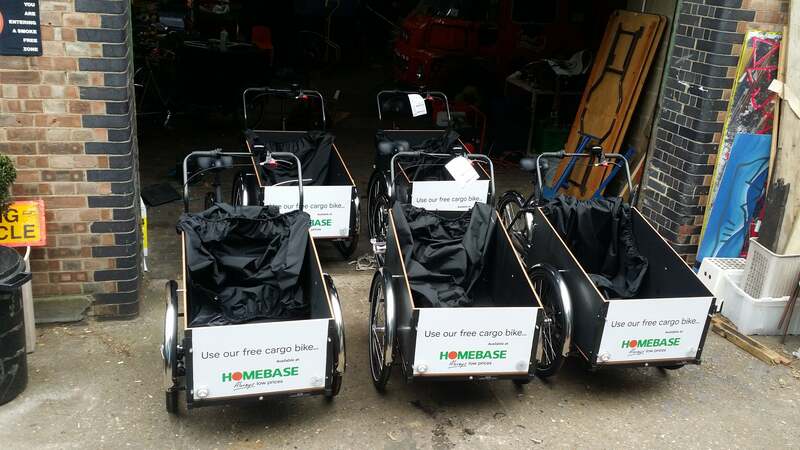 Do share pictures with us on Twitter or Facebook when you use the Homebase cargo bike!